STARGATE ORIGINS to Carry on the Adventure — in the Past! One of my very favorite science-fiction franchises, Stargate, has been sidelined for about seven years or so, but it’s coming back! STARGATE ORIGINS, a new live-action digital-only series, as announced at San Diego Comic-Con! Based on the 1994 movie Stargate (1994), which starred Kurt Russell and James Spader, ORIGINS will follow Catherine Langford, the daughter of Professor Paul Langford, the scientist who uncovered the stargate in Giza in 1928, when she was just a little girl. Produced by and for Stargatecommand.co, SO will consist of ten 10-minute episodes written by Mark Ilvedson and Justin Michael Terry and directed by Mercedes Bryce Morgan. 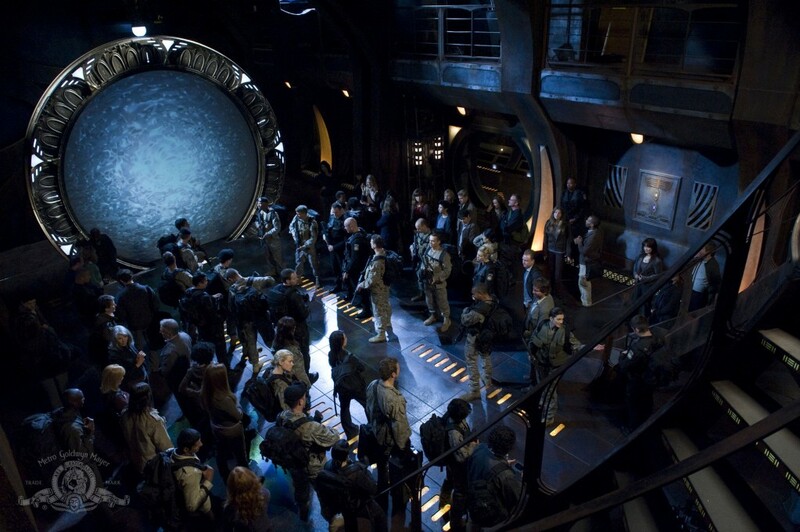 Production will begin in August for a fall debut exclusively on stargatecommand.co, a joint effort by MGM’s Digital Group and the studio New Form. SO will be not unlike STAR TREK: DISCOVERY — a digital continuation of a beloved sci-fi series that anchors a new streaming service. There’s just no getting around the fact that this week’s STARGATE UNIVERSE suffered in comparison to the last two weeks’ worth of stories. “Blockade” felt like a run-of-the-mill, average tale that would be forgotten in a regular season, but withers under the scrutiny of being one of the precious final two episodes. A large part of the problem with this story can be laid to the cancellation. If there were a season three, then the concept of Destiny refueling at different types of stars would carry much more weight; now it’s just trivia from a dead series. However, thanks to strong characterization, the show squeezed some mileage out of the possibility that the beloved Park might be boiled alive and/or blown out into space. However, I have had just about enough of the drones; they’re rapidly making the Lucian Alliance look exciting. I can’t help feeling like this elegiac two-parter should have been recast as the STARGATE UNIVERSE series finale. While not ideal, this story would have been a satisfactory makeshift end to the series. There was a certain amount of closure and hope in tale of an entire civilization founded by the Destiny crew – at least one version of Destiny fulfilled a certain type of destiny. In part one, Destiny dropped out of FTL and right into a pack of drones. After narrowly escaping, Destiny visits a planet that was populated by the descendants of the “other” Destiny – the one that resulted from the time-twisting events chronicled in “Twin Destinies.” The alternate versions of the Destiny crew became the Ancestors, the founders of a new society, when they settled on a planet they dubbed Novus Mundus (New World) more than 2,000 years ago. When Destiny was inside the star in “Twin Destinies,” it tried to dial Earth, but the ship was thrown back in time by a solar flare, and the wormhole connected with a local stargate and deposited the entire crew on an uninhabited planet. Well, not everyone: Rush (Robert Carlyle) had stayed aboard Destiny, and while the refugees hoped he would return for them, he never did. About 20 centuries later, a black hole entered the Novus system and tidal forces stirred up deadly seismic activity. Expeditions ‘gated out, looking for a new place to settle, and a small group ended up the planet on which the “current” Destiny crew found them. The stargate stopped working years ago, so the settlers wanted Destiny to return them to Novus. Also? The drones found the planet and set about destroying it, necessitating an evacuation. 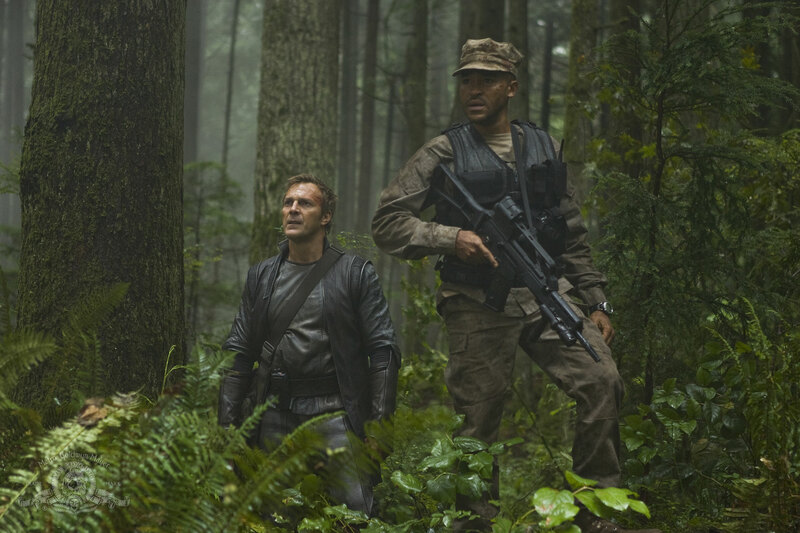 STARGATE UNIVERSE went old school with an action-packed monster mash of a sort that probably delighted sourpuss fans of the previous STARGATE franchises with the kind of space adventure that a lot of folks claim they wish SGU did more often, rather than tell more realistic stories about deeply flawed people. But this episode still packed that trademark SGU darkness, so a bunch of people died, and those who survived knew they were in a fight (yet again). The main story involved a visit to a planet where Sgt. Greer (Jamil Walker Smith) and Scott (Brian J. Smith) got the idea to hunt some local animals for meat. Which was quite a coincidence, because one of the planet’s native predators got the idea to hunt some humans for meat. The unseen creature attacked with savage ferocity, and dragged T.J. (Alaina Huffman) and Cpl. Reynolds (Greyston Holt) back to its cave to eat later. Reynolds suffered a broken leg, so of course Johansen stayed to protect him. This episode was originally planned to include more of T.J.’s back-story, but all the flashbacks were eliminated for time because the episode ran long, so T.J.’s characterization suffered this week. She came across as short-tempered and a little bitchy without much explanation. She is usually much more compassionate, so I wonder what was in the flashback story… Still, she was as resourceful and adaptable as ever, managing to repair Reynolds’ broken walkie and summon help. Okay, so it’s really hard to power a stargate to dial a nine-chevron address. And dangerous: Reaching Destiny destroyed two entire planets – and this week’s effort to connect a wormhole cost Young and Telford pieces of their souls. The planet Langara — homeworld of former SG-1 team member Jonas Quinn – is asked to use its rich naquadria deposits to provide the raw power to connect to Destiny. 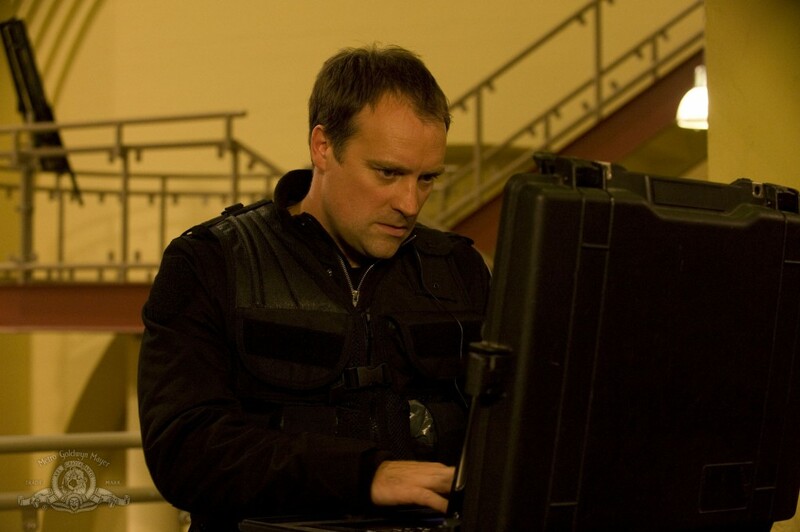 Though dialing a nine-chevron address had previously destroyed two entire planets, Dr. Rodney McKay (David Hewlett) had developed a new dialing protocol which could make Langara into a stable supply line for Destiny. However, the Langaran government (personified by Victor Garber’s Ambassador Ovirda) did not believe the technology was safe. Col. Telford (Lou Diamond Phillips) was convinced that the Langarans were on the verge of cutting a deal with the Lucian Alliance (who are looking for another chance to board Destiny again), and got authorization to… er, “demonstrate” that the technology works – by force. Enlisting Richard Woolsey (Robert Picardo) of Homeworld Command, Col. Young (Louis Ferreira) and Lt. Scott (Brian J. Smith) invaded the planet by using the Ancient communication stones to switch bodies with two Langaran officials and “invite” McKay’s team to install the dialing technology. This episode of STARGATE UNIVERSE took that clichéd “character gets sick” plot and made something special out of it by showcasing the supporting characters that are so important to this series. This was a great episode for Volker, giving him his most significant story and most airtime ever, while affording Greer another chance to show why he’s such a great character. Oh, and Ginn and Dr. Perry came back from the dead. It happens. Dr. Volker (Patrick Gilmore) was feeling a bit under the weather. Good thing T.J. (Alaina Huffman) has just gained access to Destiny’s diagnostic equipment, because tests reveal he is suffering from advanced kidney disease, and his only hope is a transplant. 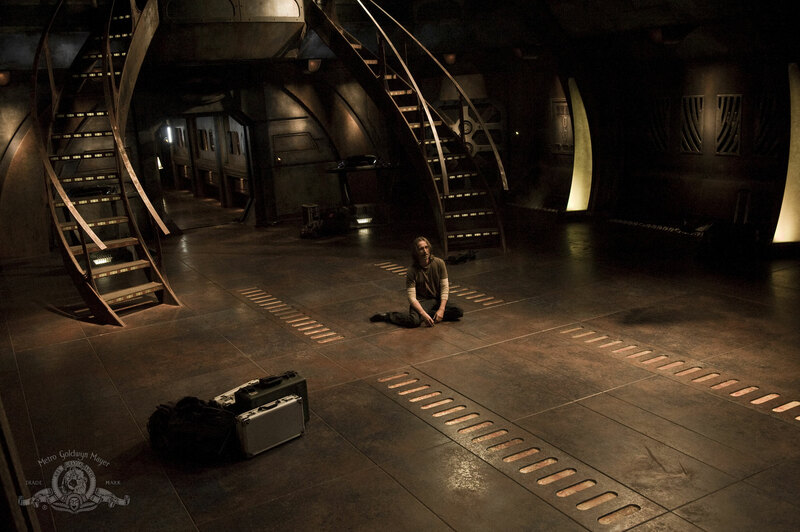 Meanwhile, Chloe (Elyse Levesque) fell asleep while awaiting a connection with the communication stones, enabling the consciousness of the late Ginn to enter her body. Since Ginn (Julie McNiven) was killed while swapping bodies with Dr. Amanda Perry (Kathleen Munroe), impressions of both of their minds were left in the ether, still linked to the stones. The personas were struggling for control of Chloe’s body. The consciousness-swapping was particularly hard on Eli (David Blue) and Rush (Robert Carlyle), who were at first elated to see the objects of their affections return, only to realize that they faced losing them all over again. This was one of those timey-wimey episodes that takes a little concentration to follow, but rewards the careful viewer. The story and its timeline absolutely do hold up, and the story works without relying on technobabble to justify/dismiss what happens. It’s just another example of how entertaining “hard” science fiction can be when leavened with a bit of time travel and vivid characters. The story saw Eli (David Blue) figure out a new way to dial Earth while Destiny refuels inside a star. The decision was made to give his plan a try, but Rush (Robert Carlyle) was adamantly against it, because while the math worked, conditions in the heart of a star are inherently unstable, and there were too many ways it could have gone down twisted. Young (Louis Ferreira) decided to give it a try, before they can dial out, they are interrupted by the arrival of their shuttle – carrying Dr. Rush. The Rush in the shuttle explained that he had been bounced back some 12 hours in time after Destiny’s attempt to dial home went disastrously wrong. In fact, the attempt resulted in the deaths of almost everyone except himself, and the loss of Destiny. Young had to decide whether to go through with the potentially risky procedure (armed with foreknowledge of what happened/will happen). The discovery of the derelict time-jumped Destiny put the kibosh on attempting to dial Earth.